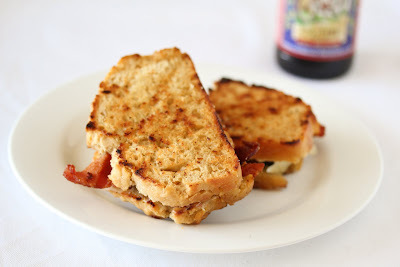 Beer bread + bacon + gruyere cheese = An amazing grilled cheese sandwich. I love beer bread. It’s so easy to make. And the end result is a crusty bread, with a chewy interior similar to artisan breads but without all the work. A faint taste of beer aroma remains in the bread that is pleasant for beer lovers and for beer haters. As part of being a member of Foodbuzz, I sometimes get to sample free products. Recently, New Belgium Brewing Company gave a $50 stipend to some Foodbuzz members to sample their beers and create a recipe featuring their beer. I immediately signed up because I knew exactly what I wanted to create. I wanted to take my beloved beer bread to the next level and make a full meal out of it by creating a beer bread grilled cheese sandwich. Beer and cheese have always been a good pairing, and the idea of a grilled cheese sandwich featuring the crusty chewy bread seemed perfect in my mind. New Belgium Beer has quite a few different beers to choose from, including their most popular, the Fat Tire amber ale. I went to the store, and was able to find a Spring Folly variety pack, letting me check out a few of New Belgium’s beers. After tasting all the different ones, I ended up choosing the popular Fat Tire. It has just enough sweetness and bitterness to match the cheese and bacon. The morning of, I made the bread. Prep time is less than five minutes. And unlike most breads that require proofing, this bread is ready to go in the oven right away. Fifty minutes later, a steaming hot loaf of bread was calling my name. It took all my will power to resist eating this entire loaf right then and there. This bread keeps well for a few days so you can make it ahead of time too. For my cheese, I chose gruyere, a type of Swiss cheese that has a distinctive creamy and nutty taste. Not too strong, but not too mild either. I also wanted to add bacon to my sandwich because bacon makes everything better. The end result was everything I could have hoped for and more. The bread was warm and toasty. The cheese was creamy and melted. And the bacon gave it that extra flavor that really made this the perfect grilled cheese sandwich for me. Make the beer bread: Preheat the oven to 350 degrees F. Grease a 9 x 5 inch loaf pan. After removing the bread, let it cool. Making the sandwiches: First cook bacon to desired crispiness. I used two bacon slices for each sandwich, so cook as much bacon as needed. Slice the bread loaf into slices of your desired thickness. I did mine at about 1/2 inches thick. Preheat a skillet with about a tablespoon of olive oil. Turn the heat to medium. Take two slices of bread and put a light layer of mayonnaise on one side of each slice of bread. Place the two slices of bread onto the heated skillet (with the non-mayonnaise side touching the bottom of the pan.) As the bread begins to toast on the pan, place a piece of gruyere cheese on top of each piece of bread. Then put two pieces of bacon on one of the breads. 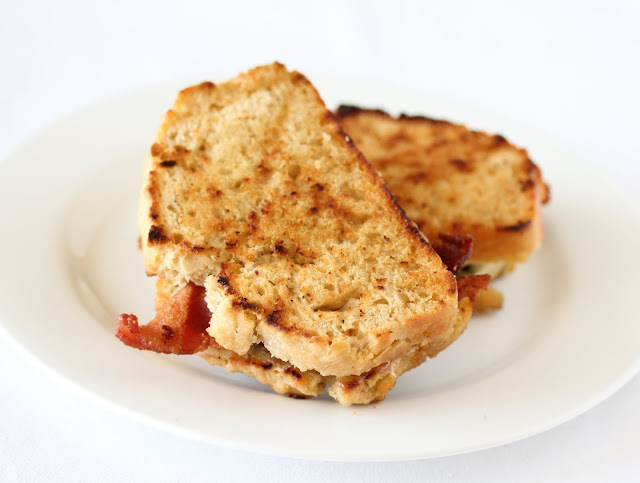 When the cheese has melted and the bottom side of bread is toasted a golden brown (about 2-4 minutes), place the bread without the bacon on top of the other to form a sandwich. If desired, you can put the entire sandwich into a George Foreman grill to create grill marks and to help press the sandwich together. Serve immediately. First, preheat the oven to 350°F and grease a 9x5-inch loaf pan. In a large bowl, whisk the flour, sugar, baking powder, and salt. Add the beer and stir with a wooden spoon until the batter is just combined. To ensure the bread bakes properly be sure not to overmix the dough. Pour half of the melted butter into the loaf pan. Spoon the bread batter into the pan and pour the rest of the butter over the top of the batter. Bake the bread for 50 to 60 minutes or until the top is golden brown and a toothpick inserted in the middle of the loaf comes out clean. Cool the bread. Once it's cooled slice it into 1/2" slices. First cook bacon to desired crispiness. I used two bacon slices for each sandwich, so cook as much bacon as needed. You definitely just took grilled cheese to another level! It’s definitely not the grilled cheese I remember from childhood (two pieces of white sandwich bread and some kraft cheese stuck in the middle. Heehee. 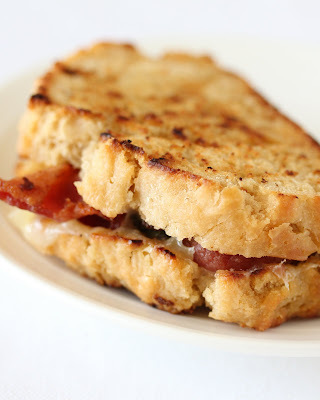 Bacon really does make grilled cheese taste better. Mayo!!! Never heard of that on a grilled cheese but love it!! I think it’s brilliant. I chuckled when I read George Foreman b/c I heart that machine. Did you add less butter on top of the bread? It doesn’t look as ‘buttery’ and shiny as I remember from you last beer bread recipe? 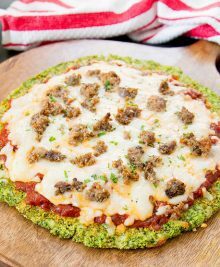 But I love that recipe – tried it a few times and my friends were like omg, it’s so good! I did the same amount of butter. Seems each loaf I make always comes out different. Not sure why. I looked at old pics and saw they look different. I felt like it needed something inside. I played with pesto and mayo and thought mayo worked best. You could probably also do butter if you don’t like mayo. This looks delicious! 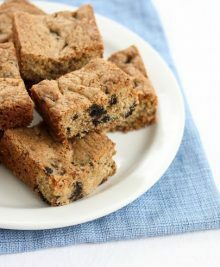 Do you think it would turn out well with whole wheat flour? I’ve never tried it with whole wheat flour so I don’t know the answer to that. Sorry. If you find out please let me know! yum! i’ve been really into grilled cheese lately too. last week i did a goat cheese, avocado, canadian bacon and cherry tomatoes with pesto sauce. mmmm. gruyere is really good too!! Mmm, sounds yummy. I love pesto. This bread looks AWESOME and sounds so easy I am going to make it today. If is turns out like I think it will then I am going to make this for my FAVORITE future Son-in-law. 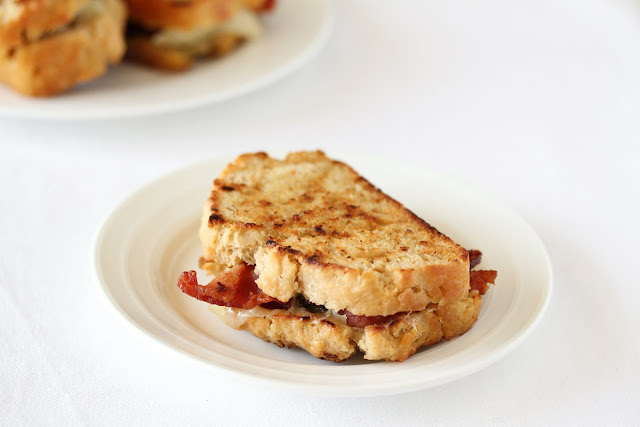 He LOVES bread and bacon and I think this grilled cheese sandwich will show him just how much I adore him. He’s so lucky to have you cooking for him!